Buy Bristol Hunt Sabs a Coffee. - Ko-fi ❤️ Where creators get paid by fans, with a 'Buy Me a Coffee' button. They're still hunting, we're still sabbing. 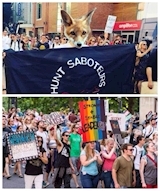 Bristol Hunt Sabs have been active since 1963 in stopping the hunting of animals. We are in the countryside week-in, week-out directly sabotaging the killing of wildlife. Every penny donated to our work goes straight to saving lives. Secured Payments. Support goes to Bristol Hunt Sabs's account. Upgrade Bristol Hunt Sabs to a yearly Gold Membership with a one-time payment.